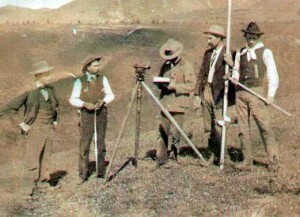 Land surveying is probably the oldest professions in the world. From that time man has decided that a part of land should be owned by a tribe, the necessity for surveying began. Land surveying is fascinating. The methods used aim to determine which portion of land is owned by whom, hopefully ending arguments completely. The bottom line is, surveying is a process using mathematical means to survey land. The very first accounts of surveying land dates back to ancient Egypt. Experts have found evidence that the ancient Egyptians used basic geometry to redraw the boundary lines when the Nile River overflowed. An Egyptian land register going back to 3000 BC was found. Following the Egyptians, the Romans – also the most powerful civilizations of the ancient world – practiced land surveying. They took it one step further and made “land surveyor” a state position inside the Empire. These folks were called agrimensores, sometimes called Corpus Agrimensorum Romanorum. Even though they used quite simple tools, they were very thorough and would create straight lines and proper angles while using these tools. Right after the lines were measured, they would create shallow ditches to mark the lines. In fact, many of the furrows they created remain today. One of several records of land surveying in “modern” times is that of William the Conqueror who wrote the Domesday Book in 1086. This book serves as a directory of land owners, the amount of land they owned, along with information about the land. While it was an astonishing volume of information during this period, the bits of information weren’t 100% correct. The locations weren’t accurate and the maps were not created to scale. Among history’s greatest icons is another enthusiastic surveyor – Napoleon Bonaparte. His interest in surveying land was actually simply a product of his desire to conquer the earth. Napoleon Bonaparte founded a registry called the cadastre. This includes a registry of properties of a county, ownership details, locations and as much information concerning the land’s value. Yes, Napoleon Bonaparte can be considered a land surveyor – and a very smart man. The methods used by land surveyors have also evolved over the centuries, over time. Years back, people would use whatever that could to help them determine the distance from one point to another. Tools that were used include chains with links and also ropes. Needless to say, this didn’t give very accurate results but they didn’t have the technology we have today. Today, land surveyors have the best technology to help with the job. There’s GPS, or Global Positioning System, which is quite possibly the most accurate technology being utilized today. Total stations are also crucial to a land surveyor of today. This instrument employs an EDM or Electronic Distance Measurement device in addition to a theodolite which allows for much more precise angle and distance measurements. For assistance on land surveying in Oxford,AL and the surrounding areas call us at (256) 733-1733 or send us a message by clicking here.